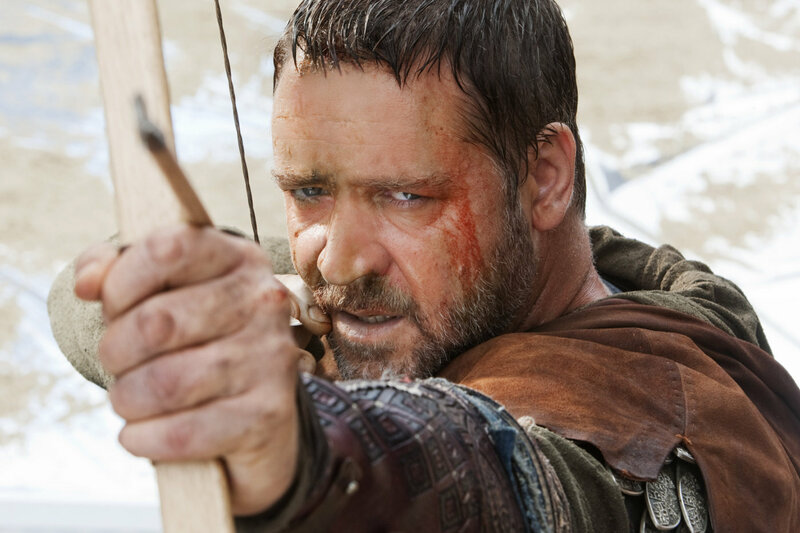 Many might have asked whether a fresh take on the Robin Hood story could possibly be found, Ridley Scott and Russell Crowe have managed to find a fresh angle, think “Robin Hood” rebooted. Commencing with an impressive castle siege at the tail end of a long campaign where King Richard (Danny Huston) has conquered or slaughtered his way through Europe, the Holy land and beyond. Burning through money that England does not possess on a campaign that no one wants. Taxes will have to go up to make up the shortfall, so times don’t always change that much. The siege is well done and we are introduced to Robin Longstride (Crowe) a humble but able longbow archer. The opening battle is presented in a workaday fashion as the usual 9 to 5 routine slog, lay siege, breach castle, kill all occupants, with a chance to drink and unwind later. King Richard is killed in battle and Robin by accident, chances upon Sir Robert Loxley’s ambushed group returning the royal crown. Robin uses the opportunity to get free passage to England by returning the crown. As he has vowed to do, he then takes the dead mans sword to Nottingham, accompanied by his trusty men at arms, Little John (Durand), Will Scarlett (Grimes) and A’Dayle (Doyle), we could almost describe them as Merry Men. Back in Nottingham, Lady Marion (Blanchett) will be stripped of her inheritance if her husband has died, there follows a “Sommersby” style romance on Longstride’s well timed return. This is well played against a backdrop of the estate gradually coming back to life. Max Von Sydow as the blind father Sir Walter Loxley, also adds gravitas and a touch of humour to these scenes. Friar Tuck (Addy) gets introduced but again in a believable way, attempting to add a human face to the usual heartless Church attitude towards the local flock.Whilst we have a sherriff of Nottingham (Mcfadden), we do not get any Alan Rickman style histrionics, as this episode merely lays the ground work for the later legend. Intrigues back in court with the new King John (Isaac) ensure that the bucolic existence in Nottingham will not last for long. Mark Strong (Godfrey) again on bad guy duties, is double dealing with these sneaky French types, attempting to invade by exploiting the vacuum following the Kings death. The ever dependable William Hurt appears as William Marshall, trying to make sure the countries budget gets balanced, whilst the new King plays away from home with his French mistress Isabella (Seydoux). The film skirts and embraces historical fact as required in the lead up to the signing of the Magna Carta. The country flirting with civil war or opting to act as a cohesive whole against the common enemy of France. It all rips along rather splendidly, leading up to a well executed beach landing battle, which is largely bloodless but realistic nonetheless. This is due mainly to attaining a lower film certificate, which overall appears in keeping with the movies intentions. Complaints, the King does not chew the scenery as much as perhaps the role requires and any movie set in this era (13 Century) is going to suffer with 2010 sensibilities. However overall this is fun, well made and takes the legend in a different and pleasing direction. Scott’s usual flourishes are kept to a minimum and Blanchette and Crowe keep the film firmly rooted in reality and provide a steady core to the film. As an aside, it is rather sad that for this quintessentially English tale that we have two Australians in the lead parts, more evidence that everything gets outsourced these days. Just plain better and more fun than you are expecting. “Robin Hood rebooted” or “Robin Hood Begins” if you will and certainly worth a watch. Crowe proving again that he is the only “A list” actor that can pull off such a role in 2010, no wonder he is in such demand. very good review, very similar to how i viewed the film. Nice one liners – rather splendidly done!